Showing 23 articles from July 5, 2014. 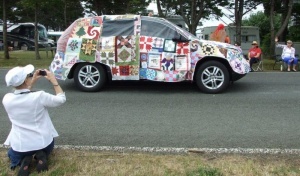 The Willapa Harbor Quilters’ quilted car won the prize as the “Cutest Car” at the annual Tokeland Fourth of July Parare. The car was driven by Vickie Fenstemacher with Mary Lou Sell along for the ride. The group created the quilted car cover in 2011 and since then it has appeared in many local and regional parades. Former Pacific County Chief Deputy Prosecutor Mark McClain has been endorsed by the Washington State Farm Bureau. Nathan Rogers, a 2010 South Bend graduate, finished his studies at Kings Point, the United States Merchant Marine Academy, in June. He will now be working for Chevron Shipping Lanes aboard their tank vessel fleet off of the west coast. Photo Courtesy Ken Grimm From left are Del Brown, Ken Grimm and Bob Beck while posing beside the Washington State pillar in Washington DC. 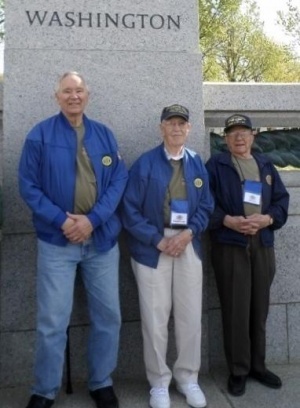 That’s how three World War II veterans from Raymond described their three-day, all-expenses paid trip to Washington, D.C., as part of Puget Sound Honor Flight’s second mission. Raymond Kiwanis will hear three interesting programs during July meetings. Legion to host anniversary dinner Sat. The President’s Honor List for Spring Quarter 2014 has been announced and includes more than 300 students earning between 3.5 and 4.0 grade-point averages for at least 12 credits in college-level courses. 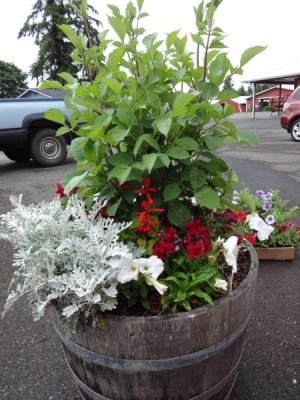 The Valley Blue Jeans garden club planted this barrel to spruce up the fairgrounds with some beautiful flowers. Fair books are out, the fair queen candidates are out selling buttons, and flowers are being planted at the fairgrounds – the Pacific County fair is gearing up. The three oldest children in the Angelovich family do 90 percent of the work involved in producing milk for the creamery. Here they are with one of the two cows they milk daily. From left to right, Ellie, Seth, and Samanatha Angelovich. For the past year, the Elk Creek Creamery in Raymond has offered raw milk made from natural, free-roaming Guernsey cows. 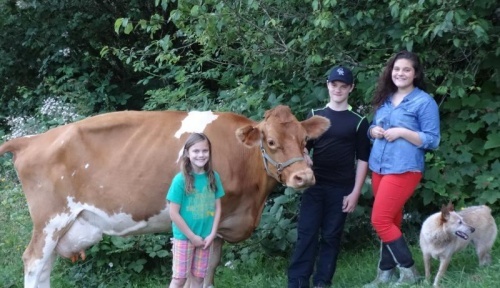 The creamery is run by Rex and Sarah Angelovich and their six kids. Can you recommend any advocacy organizations for seniors other than AARP? I cut up my AARP card a few years back when they supported Obamacare, and am now looking for another organization that better represents me. I was disappointed to see Kris Camenzind politicize a victim’s bad decisions and breach her confidentiality in the process, but lets make sure the facts are accurate so that you can decide for yourself. Four years ago we had two first class candidates step up to run for 3rd District County Commissioner, due in large part to the gross incompetency of the incumbent. One was a long time friend, the other rather unknown to me. My decision to support the latter, based on what I perceived to be her overall better qualifications, cost me a friendship. But, in the larger picture of what was gained for all of Pacific County, that was a relatively small price to pay; no disrespect intended towards her opponent. Thanks Michael J. Spencer. You just made my decision to vote for McClain much easier. 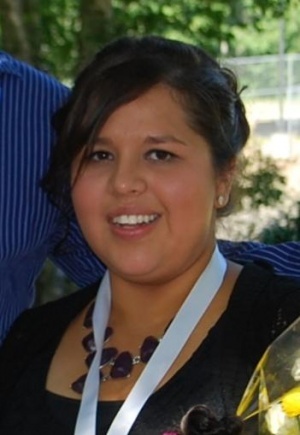 The Willapa Harbor Health Foundation would like to congratulate Monica Ortiz Ayala as one one of the recipients of the Foundations scholarship on her recent pinning and graduation from the Grays Harbor College Nursing program. Then there was one. And the rumors were true. Two local Lions Clubs, The Willapa Harbor Lions and The Willapa River Lions, have merged into the Willapa Harbor Lions as of July 1st. The internationally acclaimed All-American Boys Chorus once again brings its troupe of young singers to the Raymond Theatre. The July 20 concert titled, “An American Musical Journey!”, begins at 2 p.m. Their appearance is sponsored by Cecelia Seaman and Sunday Afternoon Live.